NCRACK-117-12 12U 31" 19" EIA 25"
3140-3-001-06 3141-3-001-06 3142-3-001-06 6U 22.5" 19" EIA 23.5"
3140-3-001-09 3141-3-001-09 3142-3-001-09 8U 22.5" 19" EIA 23.5"
3140-3-001-12 3141-3-001-12 3142-3-001-12 12U 22.5" 19" EIA 23.5"
3140-3-001-15 3141-3-001-15 3142-3-001-15 15U 22.5" 19" EIA 23.5"
3140-3-001-18 3141-3-001-18 3142-3-001-18 18U 22.5" 19" EIA 23.5"
3140-3-001-22 3141-3-001-22 3142-3-001-22 22U 22.5" 19" EIA 23.5"
1932-3-001-08 8U 31" 19" EIA 23"
1932-3-001-12 12U 31" 19" EIA 23"
3001E-2432 13U 32" 19" EIA 24"
RK1004 13U 32" 19" EIA 24"
GL480E-2432F 24U 32" 19" EIA 24"
4801E-2432 24U 32" 19" EIA 24"
Portable Racks are durable, lightweight, 4 post fixed server rack enclosures that can be stacked and are easily transportable. Portable racks offer caster wheels for uninhibited trouble-free transportation. Each rack can be fitted with corner guards so when you need more space, simply add on an additional rack. With expandable, mobile design, portable racks are the ultimate modular rack solution that will not out-grow your setup. Typical applications include: tradeshows, class rooms, campuses, modular data centers, and growing businesses. Which is the best Portable Rack for me? 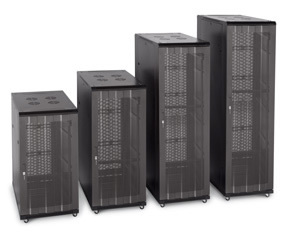 Comparing portable racks can be a daunting task. Even comparing racks with similar dimensions can be like comparing apples to oranges. In addition to your dimensions requirements, please also take into consideration the rack's cooling capabilities and cooling options, compatibility, load capacity, cable management options, rack accessories, rail mounting, and overall rack expandability. For additional help, please contact our expert sales engineers at 1-866-722-5776. * Portable racks are not synonumous with wallmount racks, but portable racks may be wallmount‑able. ** For ease in comparison, depth and width are shown here with rounded external rack dimensions. To see the specific dimensions, please view the individual rack page.